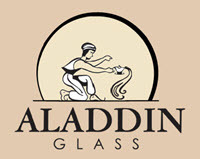 Aladdin Glass and Mirror Can Help! We can offer mirror in standard as well as double-strength type of heavy mirrors. We provide both residential and commercial installation of closets, wall, bathroom and ceiling applications. We can make custom sizes and shapes for unique applications. The primary market is residential construction and remodeling. Most of our jobs we do are residential who needs a company to specialize in quality home construction and remodeling. Due to their positive experiences with us, we find many return clients and referrals. We hope you will become part of our family of satisfied repeat customers. Our glass company specializes in: shower doors or shower enclosures, mirrors such as bathroom mirrors or custom mirrors, window repair and window glass replacement, and lastly commercial glass and commercial glazing. We are dedicated to providing excellent service to our customers for all their glass and mirror needs. We provide you a with full-service, custom glass sales and installation. We offer every type of glass and mirror you need for your home or business. We install only the highest-quality glass, so you can know for certain that all our products will be reliable and long-lasting, saving you money that you’d spend on future repairs. They are commonly used for personal reflection for grooming or admiring oneself (in which case the archaic term looking-glass is sometimes still used), decoration, and architecture. Mirrors are also used in scientific apparatus such as telescopes and lasers, cameras, and industrial machinery. Most mirrors are designed for visible light; however, mirrors designed for other types of waves or other wavelengths of electromagnetic radiation are also used, especially in non-optical instruments. A heavy wall mirror is a project that requires some care since the result could be a large heavy falling object. 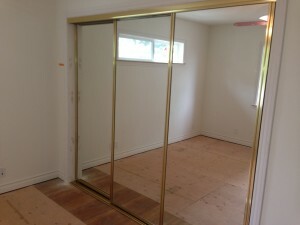 There are several ways to hang a large heavy mirror and several situations to consider. The weight of the dimensions is first. Determine how heavy it is by for example getting on a scale, noting the weight, then holding the mirror and noticing the difference- that is the weight of the mirror. The hangars used should state they support the amount of weight of the mirror or more. Determine if there are studs behind the wall. If so they should be used to hold the weight, if not then molly bolts would likely be used and the wall will likely be drywall. It can be hung by D-hooks, Z-bars, or simple screws set into the studs and mirror wire. Call a Expert!